In response to customer requests, we are now offering a version of the ShiftBrite without headers. This is convenient for customers who want to integrate ShiftBrite modules using their own choice of 0.1" headers or direct solder wiring. 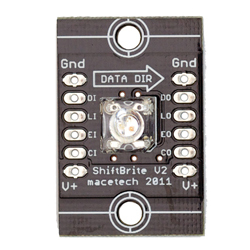 ShiftBrite is a high-brightness LED module containing red, green, and blue elements. It uses a simple clocked serial interface to receive a 10-bit brightness value for each color, resulting in over a billion possible colors. Each input is buffered and output on the other side of the module. This allows each ShiftBrite to repeat the signal to the next, allowing longer cable runs between elements without excessive loading of microcontroller I/O pins. ShiftBrite elements feature current control and automatic overtemperature control (an overheating channel driver will shut off until it has cooled). Each channel can also be adjusted with a separate current control register, for fine tuning of each LED if close brightness matching is necessary. The integrated voltage regulator powers the internal logic, allowing a single 5 to 9 volt supply rail to power the ShiftBrite chain.